Babies love sleep—they just sometimes need your help to realise it. Here are 4 tried-and-tested slumber hacks to improve your little one’s night. Light is stimulating, sending signals to the brain it’s time to wake up and play. Put up blackout blinds if curtains don’t dim the sleep space enough, and avoid overhead lights for a middle-of-the-night bum change or feed—orange tone lamps don’t disturb sleep, but still provide visibility. 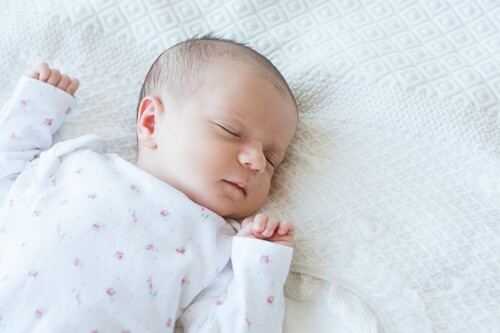 Overheating is linked to SIDS, so you want to keep your baby’s sleep area at a cool but comfy temp—16-20 degrees C is considered optimum. Mask disturbing household sounds with a white noise app or machine. The machines themselves are small and portable, so you don’t need to panic that you’re creating a tricky-to-transport sleep cue; what’s more, white noise is great for more restful adult sleep, too. Toys mean play, so if you want to avoid confusing the message about what bedtime means, keep the sleep space free from exciting gizmos and playthings. Loose toys are never a good idea in a crib or cot anyway, because they pose suffocation risks.